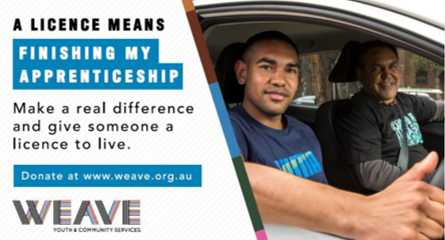 The Media Store’s ‘Young Guns’ has partnered with Redfern-based charity Weave for a new campaign to raise community awareness for Weave’s Driving Change program, securing nearly $300,000 in free media. The partnership was set up by UnLtd, the social purpose organisation connecting the media, marketing and creative industries with charities helping children and young people at risk. TMS’s 'Young Guns' program focuses on giving their youngest employees hands-on media experience. The ‘Young Guns’ chose Weave as their charity project and put together a media brief and strategy to help raise money and gain volunteers for Weave's Driving Change Program. The Driving Change program helps Sydney’s at-risk youth, mostly indigenous, obtain their driving licences by pairing them with volunteers who will donate their time to help these youths get their necessary driving practice hours in. Having a licence gives young people freedom, reduces the likelihood of them getting into trouble with the police and gives them an opportunity to get jobs. The ‘Young Guns’ secured nearly $300,000 worth of free media inventory and a partnership with Australian rideshare company GoCatch. Over three months, media and production partners, including News Corp, Audience 360, Starts at 60, Fairfax and Quantcast, donated free ad space to spread the message of this campaign. Through this campaign, TMS’s ‘Young Guns’ not only helped generate community awareness for Weave and its Driving Change program through media and social ads, but they gained invaluable experience and training. Monia Montefusco, Head of Strategy and Planning, The Media Store, said, “Through UnLtd, we partnered with Weave as it was a charity that our Young Guns were passionate about. By putting them through our rigorous training program they were able to crack an authentic strategy that aligned with Weave’s values. In turn training them to pitch their ideas to our media and content partners - who were a tremendous support - meant we were able to demonstrate true social impact beyond media value. UnLtd’s, Rachel Troy, Head of Social Impact Partnerships at UnLtd, commented on the fruitful collaboration. “By understanding the unique needs of TMS objectives, UnLtd was able to deliver a charity partner that could specifically benefit from the skills and resources that TMS was able to provide. Being the conduit between the agency and the charity ensured that the great outcomes were delivered for the charity partner, Weave", she said.